Being able to clearly and quickly answer direct questions like this can be the difference between getting hired and getting no response after your interview. First, Why Do Interviewers Ask This? They ask for a few reasons. The interviewer wants to see if there’s anything unique about you that’ll help you perform well in the job. And they want to hear your perspective on this. What do you bring to the table? What experience can you share? Always remember this is the number one thing a hiring manager wants: Evidence that you can come in and contribute immediately in the position you’re interviewing for. It’s really that simple. Yet most people forget this in their interviews and just try to sound as impressive as possible in general, without tailoring it to the company and the job. They want to hear how confident you are. So that’s another reason. They’d usually rather hire someone who seems confident in their skills and comfortable talking about their experience and strengths. So this isn’t the time to be shy or timid. You need to attack this question head-on. More on how to do that coming up! The final thing they’re looking for is how well you understand the job. They want to see if you did some research and found out about there company before you decided to start applying for jobs. Think about it… you can’t explain why you will do well in this job if you don’t understand the position. So research the company and study the job description before your interview! What’s The Best Way To Answer? I just mentioned that one of the big three reasons they ask this is to see how well you understand the position. So there’s no way you can answer this properly without knowing the job. So spend as much time studying the job and company as you spend preparing to answer this question. 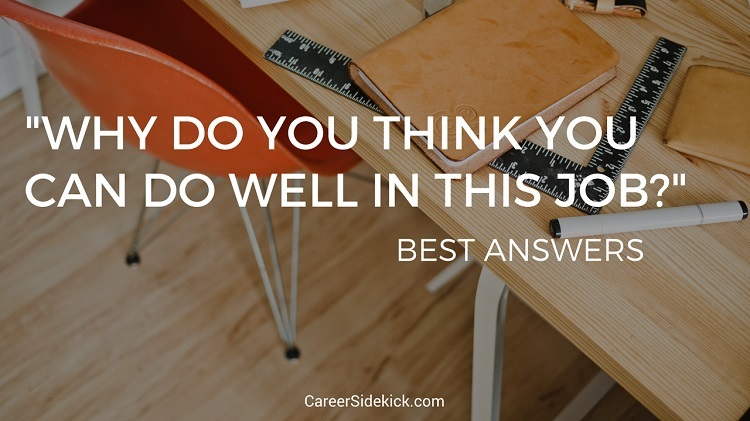 Then for your answer, tell them what you feel the job requires based on your research, and then what skills you have that will allow you to make an impact. Explain where you’ve done this in the past or what direct experience you have that’ll immediately allow you to come in and accomplish what they need. Think of it as a court of law. You need evidence. Don’t make wishy-washy claims like “I’m a hard worker and I learn fast.” Tell them about a time you learned something specific and how fast you did it. And relate it to the skills you’ll need for this job. You really need to think of yourself as a lawyer and give EVIDENCE, not just baseless claims like “I’m really determined and smart and hard-working”. Stuff like that is not convincing. Hiring managers hear it all the time. It’s easier if you’re trying to find a job in the same field. But it’s important even if you’re hopping to a new industry or type of position. The biggest mistake you can make is not doing research! You absolutely cannot do a good job explaining why you’ll be valuable to them or perform well if you don’t understand their needs. That gets me to my next mistake. If you make your answer all about you, and your accomplishments, then you’re missing the most important piece. You need to make it about THEM. How will you help them make money? Save money? Solve problems? Etc. The other mistake is being too shy or modest. They’re asking because they want you to brag a bit or share the piece of your background that you feel gives you an advantage in this job. If you don’t have anything to share, you’re not going to get the job. That’s it. Now you know how to answer this question in your interviews. Don’t forget to practice at home though. Nothing comes out perfect the first time! I don’t recommend memorizing word-for-word, just practice hitting the key points you want to hit. That way it’ll sound more spontaneous in the interview.